Three and a half years ago, Destructoid editor Tony Ponce created an enormous family tree of every Mega Man video game released. It was pretty cool, to say the least. But take a look back on it today and you'll notice a few things are missing. That's why Tony took it upon himself to revise his chart. 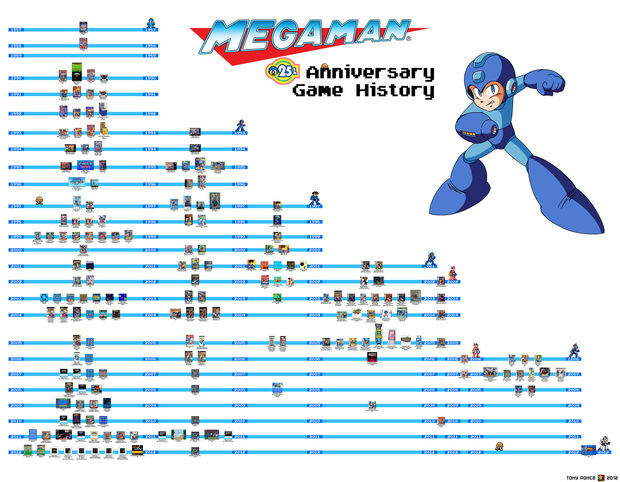 From the blue robot's humble beginnings in 1987, to Street Fighter X Mega Man, Mega Man Game History Ver. 2. touts every game under the sun. It's a shining piece of work; free of inconsistencies and spit-shined for today. I didn't put the whole chart in this post (because it's freaking huge), so click through Tony's original post at Destructoid for the download link. The full-sized chart clocks in at 9000 x 7000. That's 9MB of Mega Man history! The link is broken since years ago...ASTRONOMICAL FAIL!! !